only a few days left to support DEBRA of America. When Natasha first asked me to take part in this event - it was a direct and clear decision for me and no doubt about it. I have never heard of this disease before, but the stories are heartbreaking. So what is it all about? Epidermolysis Bullosa, or EB, is a very rare genetic connective tissue disorder that affects 1 child out of every 20,000 births (that means about 200 children a year are born with EB). EB is actually a group of disorders that share a prominent manifestation of extremely fragile skin that blisters and tears from friction or trauma. 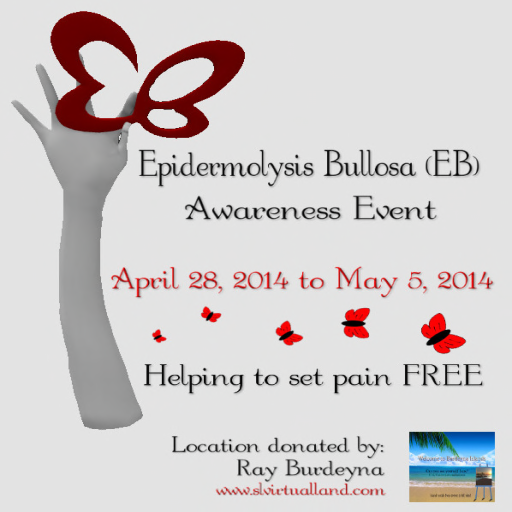 Internal organs and bodily systems can also be seriously affected by EB. The list of secondary complications can be long and may require multiple interventions from a range of medical specialists. As of today, there is no cure or treatment. Daily wound care, pain management and protective bandaging are the only options available. Every little bit helps - and that`s why NatashaAngelfire and Cerise Emor organized a Charity Week in second life. This event is to raise awareness and donations to help children suffering from EB. I created 2 exclusive skins to support the event. 75% of each sale will be donated!! So come and help raising awareness and funds for EB.